Join Gateway Arch Riverboats and Mid-American Coaches for a spectacular Mississippi River Lock-n-Dam cruise. You’ll get a chance to view, first-hand, the workings of a river lock system, the Chain of Rocks Lock & Dam 27, located in Granite City, IL. 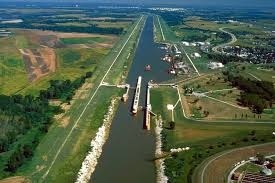 Experience the passage through the massive Mississippi lock system. Enjoy a bountiful buffet, live Banjo Band, and Captains expert commentary as you cruise to the mouth of the Missouri River on either the Tom Sawyer or Becky Thatcher Riverboats. As replicas of their 19th century predecessors, they have all the traditional steamboat charm, plus all the conveniences that modern vessels can offer. Located below the Gateway Arch on the historic St. Louis Cobblestone Levee, Gateway Arch Riverboats is the oldest excursion boat company to operate on the Mississippi -- established in 1891 with St. Louis as its home port since 1917. It’s a delightful 5 hour cruise with time to relax and appreciate the beauty of our colorful fall foliage.